In this 1995 Commentary in the Chicago Tribune, John McCarron said that Dan Bassill and the Tutor/Mentor Connection has a "master plan" for saving kids. All of the information on this and other T/MC web sites is part of that 'master plan'. This 4-part strategy of the Tutor/Mentor Connection shows that the T/MC collects information that is hosted on this site and works to increasing the number of stories in print, electronic, internet, business and faith communities that point to where tutor/mentor programs are needed, why they are needed and organizations already operating that need a constant flow of operating dollars, technical support and volunteers to grow from "good to great". In addition to these media stories look at the number of times T/MC staff have written about other Tutor/Mentor programs in Chicago in blog articles - see pdf. This article printed in the Chicago Tribune in December 1994 outlines the Public Awareness strategy that the T/MC has been leading every year since then. Below is a list of stories that support this strategy. Click the link to open a PDF and read the story. The ideas shared in these stories are just as relevant today as in the past and the challenges of poverty are even more severe. 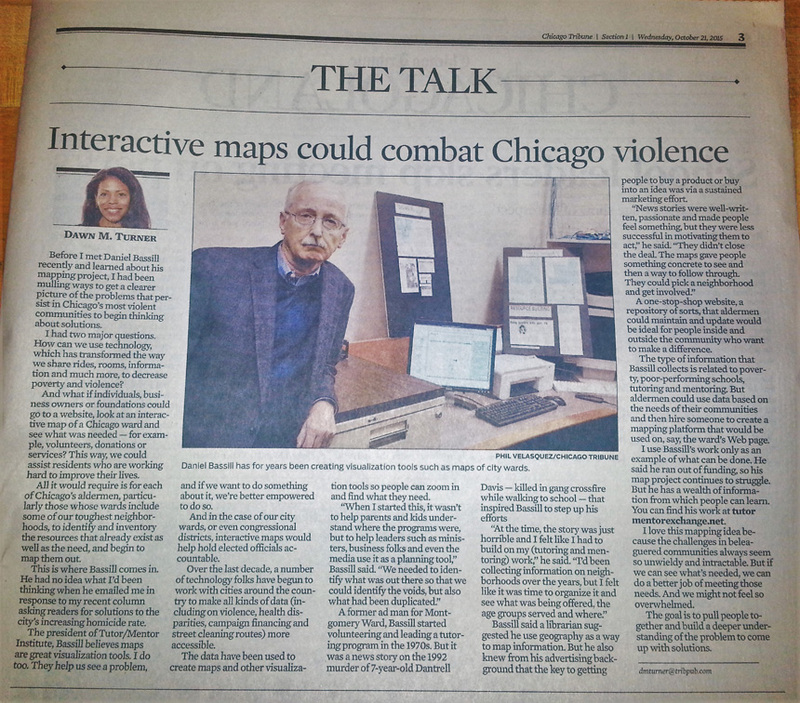 This is article from the ChicagoTribune October 21, 2015 paper showing how maps could be used in violence prevention strategies. See text from Internet version of this story. The most recent stories are at bottom of this list. See more interviews here. Awards here. Blau Exchange Interview with Dan Bassill, 1992 founder of Cabrini Connections, Tutor/Mentor Connection. 8/25/2005 Lerner Skyline Hey, anybody out there have some free time on their hands? Search on Google for "tutor mentor"or "Bassill" and see the many places where Dan has interacted in an effort to draw more attention and resources to volunteer-based tutor/mentor programs in Chicago and other cities.